How is your Super Primrose processed, and is it hexane-free? NOW Super Primrose is extracted by a natural mechanical method (expeller pressed) without the use of hexane or other chemical solvents. 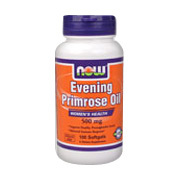 Super Primrose is a more potent, concentrated form of Evening Primrose Oil. Evening Primrose Oil is a good source of gamma linolenic acid (GLA), an Omega-6 essential fatty acid that imparts important health benefits. Evening Primrose 500mg is shipped in a discrete, unmarked package. Orders are processed immediately and usually take about 3 to 5 working days to be received. Any information received is used only for order processing and shipping purposes. Your information, such as e-mail address, will never be disclosed to a third party.